A series of research and development (R&D) projects has been launched by China’s National Energy Administration (NEA) to improve the country’s emergency response capabilities at nuclear power plants in the event of an extreme disaster. The NEA said that the projects are aimed at improving safety-related technology employed in Chinese nuclear power plants, taking into account lessons learned from the Fukushima accident in Japan. A total of thirteen R&D projects are to be conducted by China National Nuclear Corporation (CNNC), China Guangdong Nuclear Power Corporation (CGNPC) and the Institute of Nuclear and New Energy Technology in cooperation with Tsinghua University. Engineers and researchers will work to develop advanced nuclear power safety technology through targeted research and plant site analyses, the NEA said. The R&D projects will include the development of passive emergency power supply and cooling water systems, as well as development of passive containment heat removal systems. The projects will also analyse the impact of multiple simultaneous external events and response measures. Research into beyond design basis earthquake and external flooding, as well as measures for the prevention and mitigation of used fuel accidents will also be conducted. Projects will also cover beyond design basis accident mitigation equipment and systems, while others are aimed at developing hydrogen control devices and emergency rescue robots. Other projects will study the monitoring and treatment of contaminated ground and water. All the projects are expected to be completed by 2013. According to the NEA, implementation of the results will improve the safety of China’s second-generation nuclear power plant technology by lowering the probability of large early radioactive releases and reactor core damage. UPDATE: I’ve bumped the timestamp on this post to 2012 for (my) ease of access. In his marvelous “Sustainable energy without the hot air” David Mackay’s Chapter 24 Nuclear? examines nuclear power. From that chapter I extracted the memorable Moore quote above, and the graphic at left. For my own reference I wanted to include David’s computation of deaths per GWy (gigawatt-year), which he has extracted from two of the studies we’ve already referenced (ExternE, and the Paul Scherrer Institute). (…) When quantifying the public risks of different power sources, we need a new unit. I’ll go with “deaths per GWy (gigawatt-year).” Let me try to convey what it would mean if a power source had a death rate of 1 death per GWy. One gigawatt-year is the energy produced by a 1 GW power station, if it operates flat-out for one year. Britain’s electricity consumption is roughly 45 GW, or, if you like, 45 gigawatt-years per year. So if we got our electricity from sources with a death rate of 1 death per GWy, that would mean the British electricity supply system was killing 45 people per year. For comparison, 3000 people die per year on Britain’s roads. So, if you are not campaigning for the abolition of roads, you may deduce that “1 death per GWy” is a death rate that, while sad, you might be content to live with. Obviously, 0.1 deaths per GWy would be preferable, but it takes only a moment’s reflection to realize that, sadly, fossil-fuel energy production must have a cost greater than 0.1 deaths per GWy – just think of disasters on oil rigs; helicopters lost at sea; pipeline fires; refinery explosions; and coal mine accidents: there are tens of fossil-chain fatalities per year in Britain. So, let’s discuss the actual death rates of a range of electricity sources. The death rates vary a lot from country to country. In China, for example, the death rate in coal mines, per ton of coal delivered, is 50 times that of most nations. Figure 24.11 shows numbers from studies by the Paul Scherrer Institute and by a European Union project called ExternE, which made comprehensive estimates of all the impacts of energy production. According to the EU figures, coal, lignite, and oil have the highest death rates, followed by peat and biomass-power, with death rates above 1 per GWy. Nuclear and wind are the best, with death rates below 0.2 per GWy. Hydroelectricity is the best of all according to the EU study, but comes out worst in the Paul Scherrer Institute’s study, because the latter surveyed a different set of countries. David then moves on to one of my favorite topics, which he terms Mythconceptions, which include “nuclear involves huge amounts of concrete and steel whose creation involves huge CO2 pollution” and “Isn’t the waste from nuclear reactors a huge problem?” For those discussions please visit the site and buy the book! Which is now available in a Kindle version for only USD $27, the best book value I have ever purchased. For more on Dr. MacKay and the book please see my Oct 2009 post. There’s a secure solution to America’s energy problem buried under booming Carlsbad, N.M. If only Washington would get out of the way. French and US polls that I’ve read consistently show that people who live near nuclear power stations want to have more nuclear, not less. That perspective is almost impossible to find in the usual sensational media coverage. But this recent Forbes article is different. 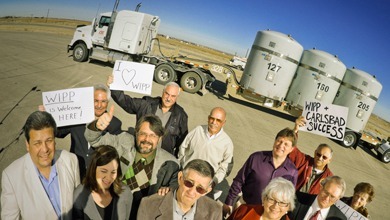 Carlsbad New Mexico is the site of the Waste Isolation Pilot Plant (WIPP ). This attitude—“Yes in my backyard,” if you will—has brought near permanent prosperity to this isolated spot that until recently had no endemic economic engine. Unemployment sits at 3.8%, versus 6.5% statewide and 8.5% nationally. And thanks to this project—euphemistically known as the Waste Isolation Pilot Plant, or WIPP—New Mexico has received more than $300 million in federal highway funds in the past decade, $100 million of which has gone into the roads around Carlsbad. WIPP is the nation’s only permanent, deep geologic repository for nuclear waste. The roads have to be good for the two dozen trucks a week hauling in radioactive drums brimming with the plutonium-laden detritus of America’s nuclear weapons production. (…) For years, local officials were worried that another town with a nuclear power plant — Oskarshamn, which is 465 kilometers away and was also vying to be the site of the repository — would end up winning the contest. The two towns decided to make a deal. The company building the repository, Svensk Kärnbränslehantering (SKB), would provide two billion Swedish krona, or about €223 million ($312 million), of which the runner-up would receive 75 percent and the winner only 25 percent. Some might say it was an attractive incentive for one of the towns to step on the brakes and come in second place. Another case of good decisions resulting from competent community consultation is Finland’s new repository at Onkalo. Please remember that what the media and Greenpeace call “nuclear waste” is actually incredibly valuable fuel for power generation. E.g., in the case of England, the UK DECC chief scientist David MacKay supported estimates that all of England’s electrical needs can be supplied for 500 years by burning the existing UK “waste”. This is in the context of Duncan Clark’s article on deployment of fast reactors such as the GE Hitachi PRISM being proposed to burn the UK “waste plutonium”. (…) According to figures calculated for the Guardian by the American writer and fast reactor advocate Tom Blees, this alternative approach could – given a large enough number of reactors – produce enough low-carbon electricity from Britain’s waste stockpile to supply the UK at current rates of demand for more than 500 years. Another terrific George Monbiot essay. David MacKay has gone public with burning the UK nuclear ‘waste’. George explains that we have three technology choices to elect for waste: bury it, MOX recycle, IFR full recycle. George favors the GE Hitachi full reprocessing package; i.e., the IFR design. Here’s a quick excerpt — more tomorrow. We can’t wish nuclear waste away: we must choose one of three options for dealing with it. Duncan Clarke’s article in the Guardian today should cause even the most determined anti-nuclear campaigner to think long and hard about the choices that confront us. He reveals that David McKay, chief scientific adviser to the government’s energy department and author of Sustainable Energy: Without the Hot Air, has endorsed a remarkable estimate. The UK’s stockpile of nuclear waste could be used to generate enough low-carbon energy to run this country for 500 years. If the material we have seen until now as waste is instead seen as fuel, it has the potential to solve three problems at once: the UK’s contribution to climate change, possible future energy shortfalls and a significant component of the massive bill – and massive headache – associated with cleaning up the current nuclear mess. The technology with the potential to solve these problems is the fast reactor, ideally the integral fast reactor (IFR), about which I wrote in December. It exploits the fact that conventional nuclear power plants use just 0.6% of the energy contained in the uranium that fuels them. IFRs, once loaded with nuclear waste, can, in principle, keep recycling it until only a small fraction remains, producing energy as they do so. (…) GE Hitachi has offered to build a fast reactor to consume the plutonium stockpile at Sellafield, though not yet the whole kit (the integral fast reactor). It has offered to do it within five years, and to carry the cost if it doesn’t work out. This is the proposal the government is now considering. I would like to see it go further and examine the case for the full works: an integral fast reactor (incorporating a reprocessing plant) that generates much more energy from the waste pile. I confess to being a bit excited to see George taking up this vital issue. And the extent of the commentary he is generating. Read the comments – see what you think. So far I would rate about 25% of the comments as being constructive and engaged. And less than 50% are of the typical unthinking anti-nuclear sort. Those comments are usually being thoroughly refuted by multiple contributors. A fascinating post by Japan-resident Eamon on Brave New Climate. It seems that even in Japan politicians “Never pass up a good crisis…” to seek political advantage. Note the brief outline of “Amakudari”, the Japanese term for revolving door from regulator-to-industry. If this practice is permitted the resulting incentives ensure regulatory capture. In the US it is common for regulators to retire on a nice pension, move a few blocks to “K Street” into a cushy job lobbying their former officemates. You can make this transition without having to change car pools. @Eamon — more questions. I’ve done some homework for you already — perhaps you could, as a Japan resident, prepare a short summary for us here on the political dynamics after the Tohuku earthquake? No problem Roger, though my call for info was because the people on this forum would likely be able to point me in the direction of scientific studies, rather than the dross that abounds on the Web these days. The political dynamics are shaped by two factors: a deeply entrenched bureaucracy that is used to shaping policy-making, and the political-class that appreciates the figurehead position that this creates. After the earthquake people expected quick movement on generating and approving finances to help rebuild the Tohoku area. This got dragged out immeasurably by political sniping (some from inside the ruling party) by those wishing to be the next at the reins of power. Also, many minor parties, often needed to form ruling coalitions, have become firmly anti-nuclear, which will complicate things in the future. One of the consequences of the powerful bureaucracy is that it is used to sharing knowledge sparingly within its myriad departments, and there has been little need for the public or politicians to challenge this given the Confucian ethos that, until recently, permeated Japan. * The Nuclear Safety Commission ignoring information from the SPEEDI System (System for Prediction of Environment Emergency Dose Information, Department of Trade, Industry and Education). This lead to evacuees staying in an area of high radiation, which could have been avoided by consulting SPEEDI. * The Nuclear Industrial Safety Agency asking TEPCO to assess the risk of Tsunamis to its Fukushima Plants. TEPCO reported back a few days before the tsunami that there was a risk of a 9-metre tsunami. * The Agriculture Ministry banning the feeding of livestock with hay, as it could be contaminated by fallout. They forgot that Japanese farmers also use rice straw to feed livestock. Result – contaminated meat. * Bureaucrats forgetting that gravel and other aggregates are stored outdoors. Contaminated gravel was widely used in construction in Fukushima Prefecture after the disaster, one condominium’s ground floor having two orders of magnitude more radiation than the local background. * Prime Minister Kan ordering the halting of seawater injection into the damaged cores due to NRC quavering on its pros and cons. Luckily the site manager requested that his staff ignore the order and they did. Please note I’m referring to public perceptions here – contaminated meat in small amounts will not have a noticeable effect (if at all) on a person’s health, though there is argument on the sensitive of young children to radiation doses. Also note that an increasing distrust of the bureaucracy (and with good reason) leads people to question what they hear from them – especially with regards to food safety these days. One of the lessons learnt from the evacuation in Ukraine was how it damaged the health of hundreds and the quality of life of thousands of evacuees. Assuming the lesson had reached his advisers, why then did PM Kan order an evacuation from a 20 km radius of the damaged power station? Did competent authorities get excluded from the advice? I will add at this juncture that my knowledge of that time is spotty – we were without electricity, kerosine and petrol, and low on supplies. We got general emergency updates over a battery powered radio. So apologies if this seems a broad summary. As for competent authorities, it’s very hard to judge, given the bureaucracy’s secrecy and industrial ties (Amadukari#), but when we got our power back the experts consulted on NHK News seemed to be non-activist academics, though that changed as bureaucratic bungling came to light. Alternatively, the Japanese Cabinet may have been misled by other advice, that more deaths would result if these people were left rebuilding after the tsunami than if they were evacuated. If so, he would have quoted an estimate of the net number of deaths averted. Please advise us of any official estimates of the consequences of action and inaction. That kind of information is not available, as far as I know, and given the lack of solid information at the time of the evacuation order it might not have been reliable enough to accurately weight scenarios. Or could it be that the order to evacuate was just a placation of a public made needlessly frightened ? Given the advance to INES Level 7 (we really need a 6.5 here!) it probably was the right choice, solidly from a public relations viewpoint, and generally from a precautionary viewpoint. The partial melt-downs that occurred back up the latter, especially given that fact that jury-rigged systems were needed, fed by an erratic power supply, to fight to stabilize the plant in the days and weeks ahead. Finally, sorry for the delay in my response. Family, work, and the need to combat anti-nuclear hype in the various fora I’m a part of in Japan kept me from it. #Amakudari – the system where bureaucrats retire to cushy jobs in the industries they previously supervised. Serving bureaucrats must ensure they do not affect bureaucracy-industry links so much that they find themselves without a lucrative post-retirement position. This makes for ineffective oversight, and often out-and-out corruption. Anti-nuclear types are attempting to mount a legal challenge, based on purported subsidies, in the EU to new nuclear power stations in the UK. One [of] their main gripes, it would seem, is the proposed carbon floor price in the UK implemented by a contract for difference mechanism. If the market price for carbon is less than the floor price, then the generators pay the government the difference. If it is higher, the government pays the generators. Current market price is about EUR 7 per tonne. Proposed market price is GBP 16. The intent seems to be to provide stability for investors in low emission plant. This is an unedifying sight, exhibiting an extraordinary level of political opportunism in the anti-nuclear crusade. Was a $23 per tonne price in Australia (roughly equal to the UK proposed floor price) opposed? Of course not. I doubt that many seeking serious emissions abatement believe that a price on carbon is not necessary (though not sufficient) and I personally find the Greenpeace position contemptuous. One further “argument” that appears to be doing the rounds is that nuclear fuel is not subject to tax (except in Germany) and this constitutes a subsidy. That’s easily fixed. How about $100 per tonne, regardless of fuel type in electricity generation? Investors would be falling over themselves to build nuclear. Personally, I hold Greenpeace (in particular) responsible for most of the coal-plant carbon emissions dumped into our atmosphere since 1980. Every megawatt of nuclear power that Greenpeace has successfully blocked has been replaced by a filthy coal plant, or more recently by less-filthy-but still polluting gas plant. Yes, Greenpeace can take the blame for the insane German anti-nuclear policy. Stanford’s Nobel laureate Burton Richter is a reliable source for effective policies that work. Dr. Richter was one of the principal contributors to the California’s Energy Future — The View to 2050. I just ordered the Kindle Edition of Beyond Smoke and Mirrors: Climate Change and Energy in the 21st Century.